A drum beat, a guitar strum, a melody, a song. A toe tap, a finger snap, and soon you’re humming along. Music can move us emotionally and physically without us having to even think about it. Its power to reach past the mind and touch the soul has a soothing therapeutic effect particularly beneficial to someone with Alzheimer’s disease or other dementias. A study published in the Journal of Music Therapy1 demonstrated that playing familiar background music helped to increase positive social behaviors in people with Alzheimer’s and decrease negative behaviors related to agitation. 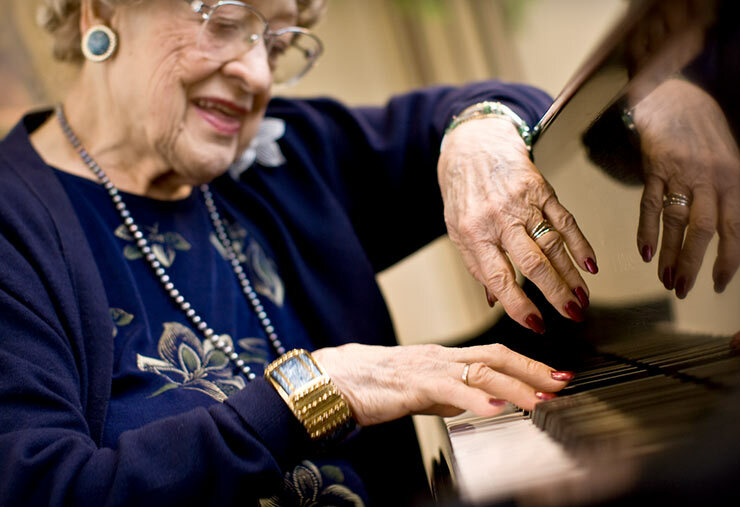 Even when the usual means of communication become inhibited by the effects of Alzheimer’s or other dementias, those experiencing memory loss still remember and respond to music. You can leverage the power of music in a number of different ways to lift the spirits of a family member with dementia and unlock memories from long ago. One way is to create a “life soundtrack” that includes memorable songs from your loved one’s childhood, teenage, young adult and older years. Research the top hits from each decade of your loved one’s life, find out what songs were played at his or her wedding, and pick out some well-loved hymns or carols. If your family member with dementia used to play a musical instrument, include music featuring that instrument as well. You can also encourage your family member with dementia to not just listen but take part in the music making. According to Preserve Your Memory magazine3, singing daily has a positive effect on one’s mental state. Many senior centers and other community organizations provide opportunities to sing with a group, play an instrument (even if just a woodblock or tambourine), or simply clap along. And when you play the soundtrack you created for you loved one, sing along together. You may be surprised how many lyrics your loved one still remembers by heart. The sea- birds- wind chimes etc. My mom loved to Line Dance, Polka and Square Dance. When she hears Polka music she grabs my dad and dances around the room. It brings tears to my eyes every time I witness it.